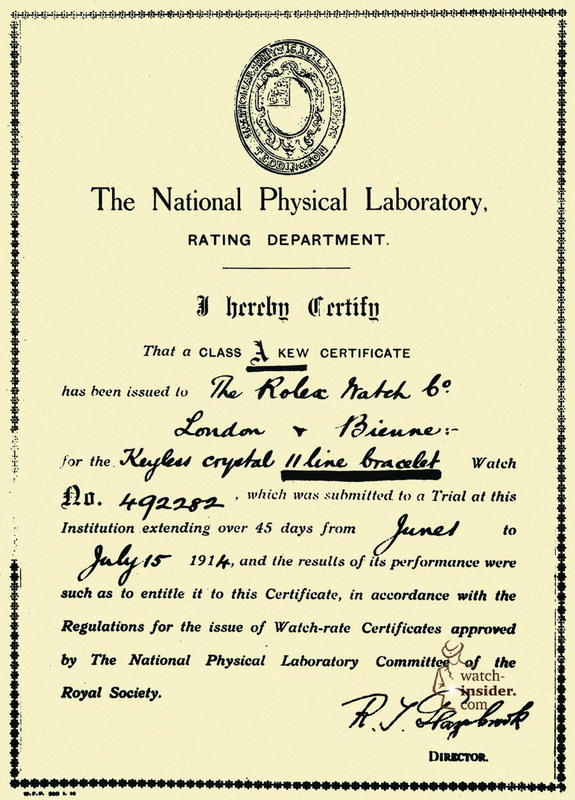 More than a century ago, in 1914, the Kew Observatory in Great Britain granted a “Class A” chronometer certificate to a wristwatch for the very first time. This was a major achievement for the timepiece in question, a tiny Rolex watch, and it also marked the advent of the modern precision wristwatch. In this article from the Watch-Insider.com archives, I explore the full story behind this watch-world milestone, and trace the evolution of the Rolex “Oyster” watches that resulted from it, with photos of all the major Rolex Oyster models from 1926 through 2014. 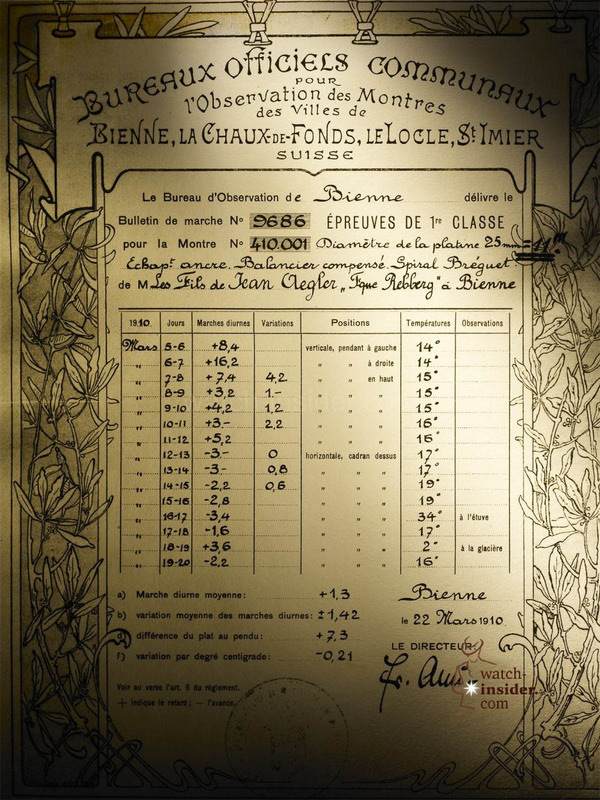 Until July 15, 1914, the “Class A” certification, which attested to the highest chronometric precision, had generally been awarded only to large marine chronometers after extremely rigorous tests. Rolex was, in fact, the first to prove that a wristwatch could be just as precise as a marine chronometer – a notion that was scarcely believable at the time. 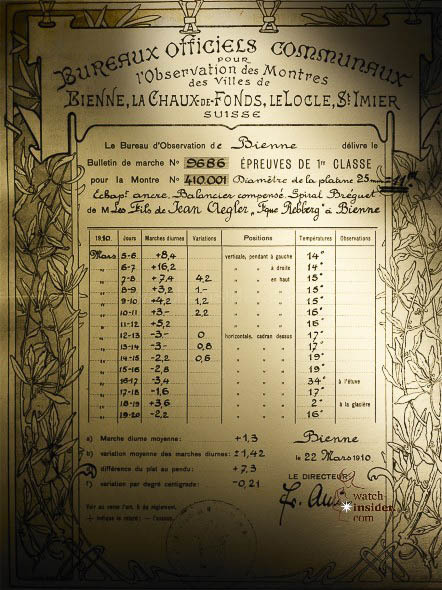 Rolex’s first success in this area had, in fact, already come in 1910, when it obtained a chronometer certificate for a small watch from the Official Watch Rating Center in Bienne, Switzerland (as seen below). 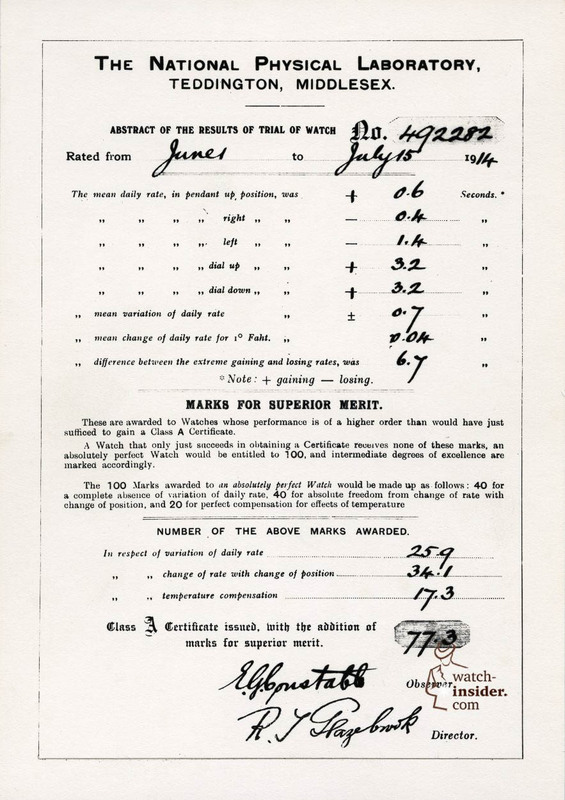 This proof of performance would contribute significantly to the rise of the wristwatch in popularity. On the strength of this achievement, Rolex would eventually become the world’s largest manufacturer of chronometer-certified wristwatches. The Geneva-based brand perfected the concept of the modern watch in 1926 by inventing the waterproof “Oyster” case to protect the movement inside and then, in 1931, by developing the self-winding “Perpetual” rotor movement. Today, all Rolex Oyster Perpetual watches are officially certified chronometers, carrying on the heritage of the pioneering role the brand played in bringing precision to the wristwatch. That milestone feat of miniaturized precision – the very first “Class A” rating certificate for a wristwatch from the Kew Observatory near London, occurred on 15 July 1914, and would forever change the destiny of the modern watch. This first chronometer wristwatch not only met but passed with flying colors the British observatory’s demanding criteria, the most stringent in the world: 45 days of tests, in five different positions and at three different temperatures (ice-cold, oven-hot and ambient). For the first time in history, a wristwatch fulfilled the requirements expected of the best marine chronometers. These navigation instruments, whose precision was used to determine the position of ships at sea (longitude), could not deviate by more than a few seconds per day without putting the safety of the ships at risk. 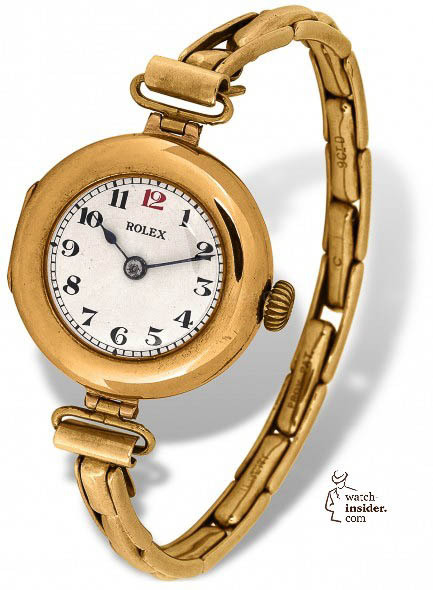 The tiny Rolex wristwatch that was certified by Kew 100 years ago recorded an average daily rate of only +1 second. This was the moment when the wristwatch gained legitimacy at the prestigious Observatory tests. The man behind this feat was German-born Hans Wilsdorf, who founded Rolex in 1905. 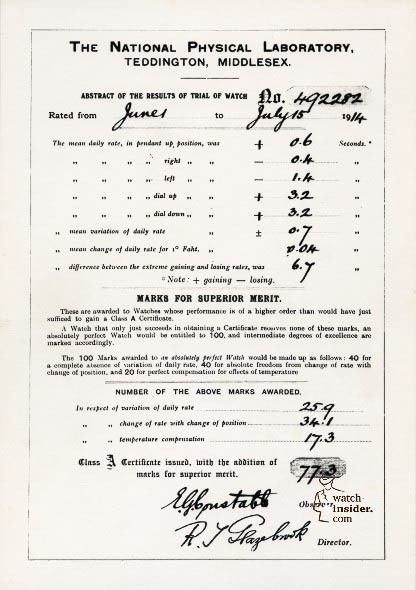 By obtaining this first chronometer certificate from Kew, Wilsdorf demonstrated that, in terms of precision, a small wristwatch could rival that of the best timepieces, including pocketwatches, which were the norm at the time. Thus, nearly two centuries after John Harrison designed the first marine chronometer, Rolex targeted an equal level of precision for a wristwatch. In those early days of the 20th century, no one had yet managed to design a truly reliable and precise wristwatch. Wristwatches were not in favor at the time, because their comparatively small mechanisms could not compete with the regularity and reliability of the larger pocketwatch movements. 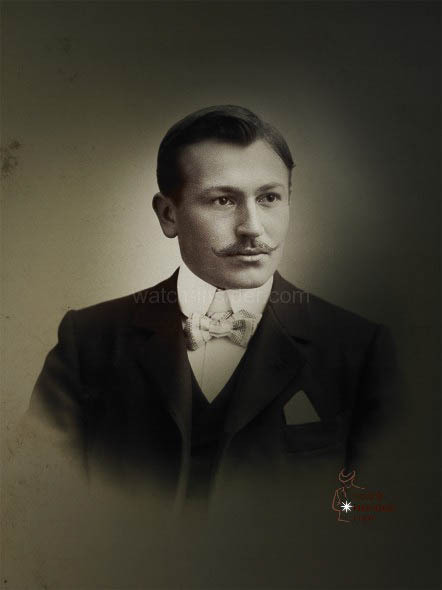 However, since the beginning of his career, Wilsdorf had been firmly convinced that the wristwatch would be future of the watchmaking industry. He devoted the energy of his youth to eliminating all the wristwatch’s weak points and made the quest for wristwatch precision his first objective. A visionary entrepreneur, Wilsdorf was firmly convinced that precision was essential to ensure the acceptance and eventual popularity of the wristwatch. Rolex is one of the historic leaders in timekeeping and a true pioneer in chronometer wristwatches; Rolex made certified precision its signature. By the early 1950s, Rolex had manufactured nearly 90 percent of all chronometers officially certified in Switzerland since 1927, the year specific criteria for chronometer wristwatches were introduced. When, in 1951, the regulations changed and it became compulsory to obtain chronometer certification from an official body, Rolex went further and made sure its movements obtained certificates bearing the citation “particularly good results.” This distinction gave rise to the famous phrase still inscribed on Rolex watch dials today: “Superlative Chronometer Officially Certified”. Since the creation of the COSC (Swiss Official Chronometer Testing Institute) in 1973, special citations are no longer given on the certificates. But the signature on Rolex dials is a reminder that since the early 20th century, Rolex has played a central role in the development of the modern precision watch. Continue your historical excursion into Rolex watches by taking a look at the brand’s major Oyster Perpetual watch developments from 1926 through 2014.